While forehead wrinkles are natural, albeit unfortunate, results of aging, you can do something about them. If you are bothered by the premature appearance of forehead wrinkles or if you simply want to delay the inevitable, there are a number of steps you can take to reduce their appearance. Although a surgical facelift may help get rid of your forehead wrinkles, there are other, less invasive ways to smooth out the surface of your skin. Injectable collagen is considered safe for use in just about every area of your face. While very effective for reducing the appearance of fine lines, injectable collagen is also an effective treatment for folds and creases around your forehead. These injections are done in your doctor's office and they can be repeated every two to four months, according to the University of Maryland Medical Center. According to the U.S. Food and Drug Administration, the effects of collagen injections can be expected to last for three to four months. If your facial depressions or wrinkles are deep, you may require more than one injection, according to Novant Health. 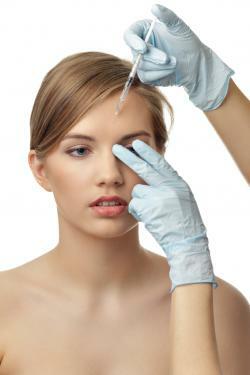 BOTOX® injections should only be used under a physician's care. If your doctor is not comfortable administering the injections, ask for a referral to a doctor who specializes in BOTOX® injections. Before your doctor injects the actual BOTOX®, he will administer an anesthetic medication to the area so that you won't feel the injections. You can resume your normal activities after the injections, but make sure you don't rub the treated area to ensure that the toxin does not travel to other areas of your face. You'll notice results after a few days. According to RXList.com, local reactions to botulinum toxin injections include redness at the injection site, bruising, bleeding, and inflammation. Gently applying an ice pack to the treated area can help minimize local reactions such as swelling and mild discomfort. It's also important to smile more. According to Murad.com, frowning can cause forehead wrinkles and a furrowed brow because of the repetitiveness of the motion. This means being happy and smiling often can help you stay wrinkle-free!